Last week I hinted at my interest in the vision of a smart city in which connected and engaged citizens bring smartness about instead of sensors, feedback loops and algorithms. One of the many ways this smartness surfaces is urban farming. Another manifestation of this smartness that I find deeply fascinating is the getting together of citizens who set out to enhance/improve their urban environment. In bottom-up urban planning we all get a say in the design of our street, block, neighborhood or city. Citizens are increasingly more often getting together and starting Kickstarter-like projects to fund an enhancement to their neighbourhood. The year-old Citizenvestor aims to close the gap between people with ideas and their local government. The days of dull meetings in the city hall seem to be ending. While funding a public bench with your neighbours is a feasible project “you can’t” – as Dan Hill succintly remakrs – “crowdsource lightrail”. Crowdfunding urban interventions seems to work best for small and highly local projects. Crowdfunded urban projects are capped financially because the number of people who care for a certain project are probably located in the vicinity of said project e.g. the chances of someone in Japan funding a project in Germany are nill. Another important issue to consider is legislation; citizens cannot do whatever they want, even when the funding is secured. They need to adhere to zoning plans, safety regulations, secure the backing of their neighbours, etc. The folks at Brickstarter have thoroughly investigated all the aspects involved in the urban crowdfunding process and especially the communication between the people and local governmental bodies. One of their conclusions is that the citizens are ahed of government; local authorities in Finland find it difficult to cope with this new form of city making. We use Geodan’s Phoenix applications to collect the people’s ideas about how to organize and design the city. It is here, in the meeting of bottom-up and traditional governing bodies and practices, that I see great potential for deploying modern information technologies to start a constructive discourse between both parties. Participatory place making involves a large number of highly diverse people and therefore calls for streamlined and intuitive tools. I want to contribute to this issue by figuring out what geospatial tools can aid design phase of a project and how these are to be deployed to support the deliberation process. More specifically, I want to analyze how modern geospatial technologies can help citizens and urban planners to cooperate in future place making. Of course, technology plays a minor role in the whole conversation. My goal and focus is therefore to bend the technologies to fit the process instead of imposing it on the people in a “here, use this” manner. Geospatial technology is, for reasons I’ll discuss in a later post, very much underused. I see a great deal of opportunities to improve the tools (ever so slightly) to make the deliberation process easier, more transparent and more pleasant. I’ll be making headway in this direction by participating in urban planning projects in which citizens want a place at the discussion and planning table. The plan is to analyze the needs of both parties and see I am currently exploring the various disciplines involved in urban planning in order to better design an experiment/lab/trial in which to test the role of technology. In the project A Living Wall citizens of the Utrecht neighborhood Lunetten are anticipating the broadening of nearby highways, and accompanying increase in sound and noise pollution, by proposing a multifunctional sound barrier that is home to creative companies, food and energy production, waste processing and air filtering as an alternative to standard sound barriers. A Living Wall is a concept aimed at starting a conversation between the involved parties about alternative sound barriers solutions. The idea is to source a large number of designs from several sources, analyze the effect of each one and choose the most suitable solution in terms of air and noise pollution reduction, and cost. Local architects together with a citizen representative are pushing the project and are seeking for partners who can help them create a strong design to present to the planning authorities and start a meaningful deliberation process. Key to the deliberations is amplifying the citizen’s voice and ability to analyse the effects of different sound barrier designs. To facilitate this we’ve come up with the preliminary tool chain. Data collection: Phoenix, a 2D mapping tool is used to gather information about the citizens’ ideas. The plan is to use this information to group citizen’s ideas, look for consensus and to prioritize efforts. Visualisation and scenario creation: esri’s CityEnine is used to turn the 2D citizen input into 3D scenes that can parametrically be modified to form different scenarios. Next to creating 3D geometries, CityEngine acts as a communication and envisioning platform. 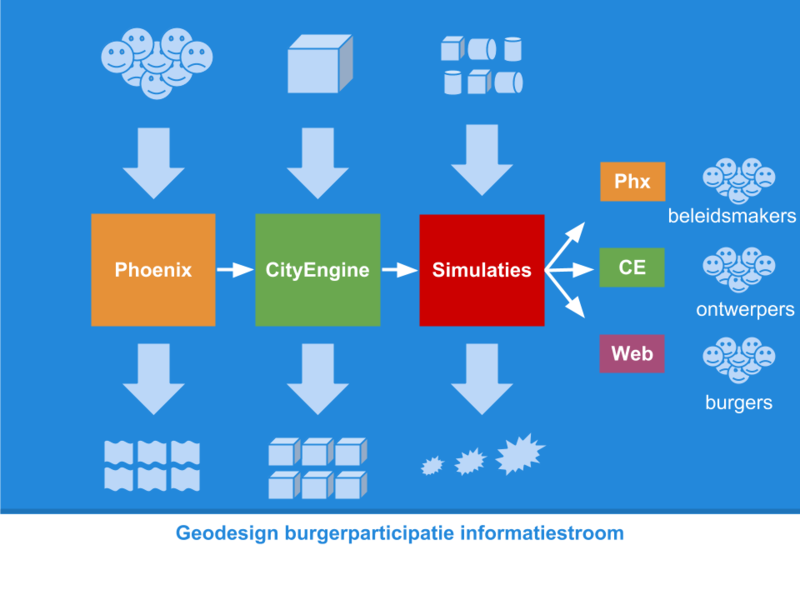 Simulation: The output of the CityEngine is sent to the UrbanStrategy sound and pollution model made by TNO to calculates the effect of the implemented intervention. These platforms play the dual role of input collectors and envisioning, and communication and dissemination channels. For example, Phoenix can also be used to display the aggregate of all citizen ideas. The image below shows the envisioned information flow. This methodology is nothing new. Urban planners have dreamed of a setup that gives immediate insight into the consequences of a design for almost as longs as computing has existed. We’ve finally arrived at a point in time in which all components are full fledged products and computing power has come of age such that it is possible to link these parts and let them operate in near real-time. But more importantly, society seems ready for such inclusive deliberation processes and methodologies. People are becoming increasingly more aware of their effect and role in the upkeep and management of their environment. People are claiming responsibility for the creation, maintenance and improvement of their surroundings and are a ceasing to expect things from government; smart citizens are on the rise. Next week I’ll cover the geospatial analysis we are planning to do, the scientific setup and I’ll go a bit deeper into the functioning of the different tools.